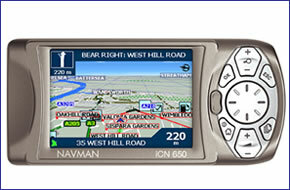 The Navman iCN 650 is the ultimate Pan-European in-car navigation system. Incorporating the very latest GPS technology, design and software, the iCN 650 is a feature rich system that sets the standard for transferable navigation. It comes fully loaded with maps for 16 countries in Western European on a 2Gb internal hard drive. The iCN 650 is the complete 'Drive-AwayT' solution, straight from the box. Navman iCN 650 has been discontinued. Accessories, spares and parts are still available for your iCN 650. The system benefits from Navman's GPS heritage and expertise spanning two decades.It comes pre-loaded with Navman SmartST V3 navigation software and the latest street-level TeleAtlas maps which include 16 countries in Western Europe. The Navman iCN 650 has been designed to be Plug & Play, and as such can be transferred from vehicle to vehicle with ease by the user. The Navman iCN 650 is powered with a 12-volt adaptor cable in-car. The provided mains A/C power adaptor allows for use in the home or office, when configuring a route (cables included). Although the Navman iCN 650 has been discontinued, a number of accessories are still available to buy from ActiveGPS. These accessories and spares include: vehicle power cable, AC mains power charger, remote control and external GPS antenna. View all Navman iCN 650 accessories and parts here.